Resources from the workshop are now available online to download. Europe – will the Euro survive? This has applications for equity and bond investors, regulators, banks, corporates, firms engaged in avoiding financial distress and sovereign risk. Edward I. Altman is the Max L. Heine Professor of Finance at the Stern School of Business, New York University. He is the Director of Research in Credit and Debt Markets at the NYU Salomon Center for the Study of Financial Institutions. He previously chaired the Stern School's MBA Program for 12 years. He has been a visiting Professor at the Hautes Etudes Commerciales and Universite de Paris-Dauphine in France, at the Pontificia Catolica Universidade in Rio de Janeiro, Macquarie University, Australian Graduate School of Management, University of Western Australia, Luigi Bocconi University in Milan and CEMFI in Madrid. 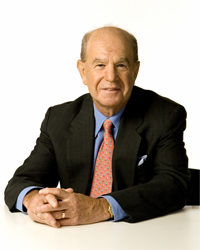 Dr. Altman was named to the Max L. Heine endowed professorship at Stern in 1988, andhas an international reputation as an expert on corporate bankruptcy, high yield bonds, distressed debt and credit risk analysis. He was named Laureate 1984 by the Hautes Etudes Commerciales Foundation in Paris for his accumulated works on corporate distress prediction models and procedures for firm financial rehabilitation and awarded the Graham & Dodd Scroll for 1985 by the Financial Analysts Federation for his work on Default Rates on High Yield Corporate Debt. Professor Altman is also the Chairman of the Academic Advisory Council of the Turnaround Management Association. He was inducted into the Fixed Income Analysts Society Hall of Fame in 2001, President of the Financial Management Association (2003) and a FMA Fellow in 2004 and was among the inaugural inductees into the Turnaround Management Association’s Hall of Fame in 2008. Prof Altman was named one of the "100 Most Influential People in Finance" by Treasury & Risk Management magazine in 2005. He also received an Honorary Doctorate from Lund University, Sweden in May 2011. Dr. Altman's primary areas of research include bankruptcy analysis and prediction, credit and lending policies, risk management and regulation in banking, corporate finance and capital markets. He has been a consultant to several government agencies, major financial and accounting institutions and industrial companies and has lectured to executives in North America, South America, Europe, Australia-New Zealand, Asia and Africa. Last Updated: 2013-04-08 12:56:07 by Emily Inglis .